Versatile, attractive, and even decorative, bamboo is certainly a treasure. Perfect for clothing and as a building material, the grass is also an beautiful and sustainable choice for adornment. Why wear precious stones or valuable metals that need to be extracted from the earth when you can decorate yourself with one of the fastset growing plants in the world? Bamboo is renewable, and generally far less expensive than most costume or fine jewelry. 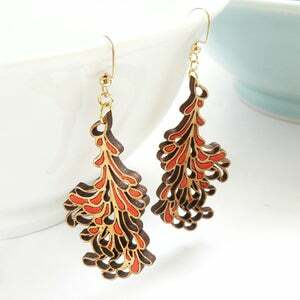 -Designer Yvonne Hung uses a lasercutter to create her gorgeous geometric and organic sets of earrings and necklaces. Highly graphic in appearance, Hung first began her work with the lasercutter in architectural school working with models. Inspired by patterns from both nature and human-made structures, her line of jewelry looks modern in composition while still retaining a warm texture. -For its engraved pendants, SilverBug Studio uses bamboo as the perfect canvas for lasercut illustrations. From lotus flowers to trees, each creation is lightweight, lovely, and inexpensive. Beginning at $24, the charms are great gifts that will go will find a place in almost anyone’s wardrobe. -Folia Design based in San Francisco works exclusively with bamboo, pairing the pendants and earrings with gold-filled hardware. Fashioning insect wings, leaves, plant pods, and grids from the hearty grass, Jessica Coleman has a wide assortment of designs to choose from. -Looking for a rustic wood aesthetic with a sustainable twist? Cabin + Cub Design brings the great outdoors into the home and onto your person with their collection of whimsical earrings, brooches, and tie pins. Featuring forest creatures, maps, and quirky quotes, this is accessorizing with a sense of humor. -For the gentleman, a bamboo watch will certainly make a sustainable statement. Reveal’s bamboo watch sports a casing and wrist band made from the material, trading in metal or leather for an organic, earthy look. As an added bonus, energy giant BP has partnered with the watch-maker to raise money with each purchase to continue with the Gulf spill cleanup efforts.